I made a small tool to help automate FTK Imager CLI. This is mostly to save me the human time of moving forensic images, verifying a bunch of images, or reacquiring them to save space. I tried to make it run in parallel as much as possible as possible, but only read or write once from a disk at a time. So if you have 2 source disks and 2 destinations it'll do 2 copies at a time, rather then 4 so that overall the copies go faster. Hosted on GitHub so feel free to tell me how bad the code is! Cannot say how common it is the need to verify "in bulk" a whole SAN (or whatever large storage media) filled of .E01 images, but the consolidating is probably the most useful feature. I am failing (at first sight) to understand the *need* to use the thingy to re-acquire an image (in the sense of improvement over re-acquiring it directly with FTK CLI) . at its core, isn't it a (nice) Python script? It sure is just a python script, you can get the source by clicking the 'Download Source' button or you can follow the 'View on GitHub' link to get to the main project page, maybe I should make the icon bigger. (or just click here for the script). The other small benefit of the installer is that it sets up the context menu for verifying, but thats about it. For me I do mostly use it for consolidation, connect a few drives and leave it over night and the two copies are ready in the morning. The re-acquire is mostly because it's offered by the FTK Imager, so I thought why not, maybe one day someone will need to compress 10+ images at once. I think I've only used it once myself. The other small benefit of the installer is that it sets up the context menu for verifying, but thats about it. Yep, which is something that can be seen as a feature or as an annoyance , being like beauty in the eye of the beholder. Not a critic to your thingy, mind you, only if I had right-click menu provision for each program I have on my machine I would probably need a second monitor to allow all of them to show. Good point - I can probably make it optional during the installer. Then at least it gives the user the choice. jaclaz - I've set up the context menu to be optional now. Anything else you think should be changed/added/improved? Works great. Will be very useful for the consolidation and mass verification of evidence. tool that can verify these formats. 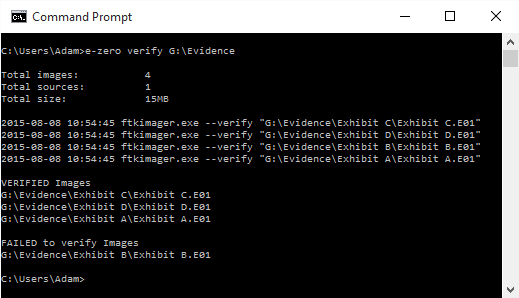 I know you can use ewfverify of the ewflib tools and it will try to verify a L01 , but as L01 files don't contain a hash to verify it just creates a hash of the content. AD1 seems a lot better than L01 being that it stores hashes that can be verified, pity Encase still doesn't support AD1 like most products do as it would make my job a lot easier.